In this issue we look at more medieval roads in Fifeshire, "riding" and "wading" stones, the old road between Carluke and Lanark, and the RCAHMS Inventories that contain many references to old roads. For previous newsletters see here. This site aims to provide an overview of the history of roads and tracks in Scotland. It is mainly organised by historical period although some material is organised on a geographical basis or by source material. A large number of resources are listed, many of them online, and these will be found useful for further study. 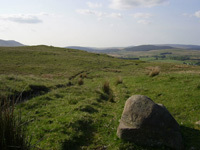 This section gives an overview of roads and tracks in Scotland covering the first tracks of prehistoric man, Roman roads, the Dark Ages and a brief "golden age" in early mediaeval times. It also covers the post-mediaeval period and the statute labour system that developed at that time and then the turnpike system which lasted to the late 1800�s when roads became the responsibility of local authorities, a situation that has continued to the present time. A study of roads and tracks in Ayrshire from prehistoric times up to the present. It covers prehistory, Roman times, the Dark Ages and the mediaeval and post medieval periods. Details of the pre-turnpike system shown on the Military Survey maps of c.1750 are given followed by details of the turnpikes and local parish roads. It concludes with an account of the work undertaken by the County Road Board and Ayr County Council. This section lists a large number of resources which will be found useful in studying old Scottish roads, whether in a particular part of the country, a specific historical period or a type of road such as military or drove roads. Apart from showing a number of roads, these maps, first published in 1654 in Blaeu's Atlas but surveyed in the 1590's show river crossings and placenames that help to reconstitute the road network of the time. The Old and New Statistical Accounts of Scotland, written respectively in the 1790's and 1830's, give a description of each parish in the country. These accounts contain many details of roads and transport that would otherwise have been lost. In this section, details are given for each parish with links to the original text. For those interested in roads in a particular county, this section provides links to parts of this website dealing with specific counties as well as useful external links. It also has summaries of roads entries from the county volumes of the Cambridge County Geographies published in the early 1900's. Short articles on various topics. Currently contains notes on the road between Newbattle Abbey and the Monklands, an old road between Ayr and Kirkcudbright, some roads referred to in mediaeval charters, references to roads in Chalmers' Caledonia and MacFarlane's Geographical Collections, the toll points of Ayr and Rutherglen, Wade's Military Roads and Roman roads. The newsletter Rambles on Old Roads can be accessed here. About the author: This site has been developed by Gerald Cummins who worked as a road safety officer in several local authorities in the west of Scotland. His most recent post was with East Ayrshire Council where he developed an interest in the old roads of Ayrshire. Since retirement he has been working on roads in the south of Scotland. Acknowledgements: I should like to thank former colleagues in East Ayrshire Council for their interest and support in this work. In particular I have to thank Jim Kane, Head of Roads and Transportation for his support and Tom Allan both for his interest and for information about the 1878 List of Roads and Bridges in Ayrshire. A number of excerpts from Ordnance Survey maps dating from 1945 or before are included to make the text easier to follow. My thanks to the OS for advising me on the use of these maps. My thanks also to the National Library of Scotland for permission to use images from the Blaeu Atlas and Pont originals and to library and archive staff in Ayr, Dumfries and other locations. Copyright: Although the site is copyright ©, links are welcome. Please contact me if you wish to use any other material on your own website. Copyright 2007 oldroadsofscotland.com. All Rights Reserved.